These are some of our favorite Rome restaurants. From Al Pompiere's Roman Jewish cuisine to Broccoletti's organic offerings, you'll find yourself in food heaven. Al Pompiere serves traditional Roman fare and Roman Jewish cuisine. It's a good place to try the famous carciofi alla giudia (Jewish-style fried artichokes) or fiori di zucca (fried stuffed zucchini flowers) as an appetizer. A local favorite since 1962, there are several rooms that usually fill up with the dinner crowd. Armando al Pantheon is a lively and crowded restaurant on a street just off Piazza di Rotonda, the square where the Pantheon sits. The food is good and prices aren't too high. They have some interesting specialties and offer a vegetarian menu. In business since 1961, the restaurant usually has a mix of locals and tourists. 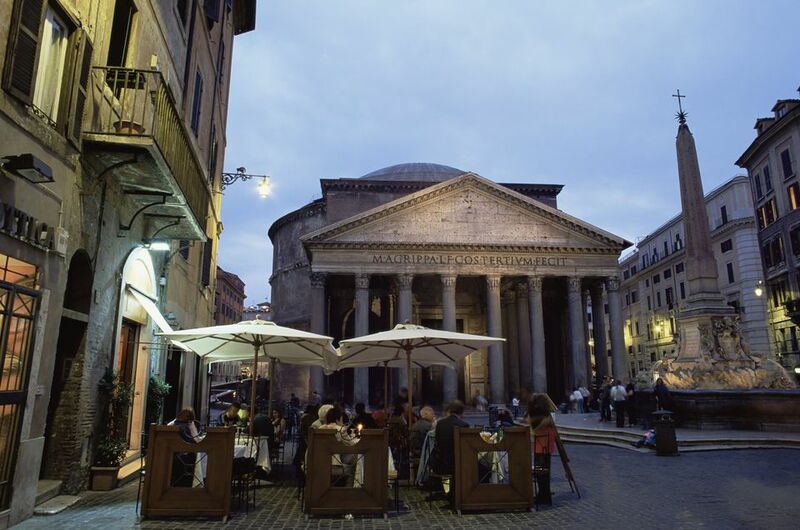 Before or after dinner, splurge on a drink outside in Piazza di Rotonda. Le Mani in Pasta in Trastevere, across the Tiber, serves great dishes made from scratch (so not the place to go if you're in a hurry). The homemade pastas were fantastic. There is a good selection of appetizers, pastas, and seconds including seafood, meat, traditional, and vegetarian options. The lunch crowd when we were there on a weekday was mainly locals. Since it's small, you may want to reserve. In Rome's Monti neighborhood, very close to the Forum and Colosseum yet away from the tourist crowds, there are several good restaurants. Our friend Gillian, who lives in the neighborhood, took us to Broccoletti (see photos of our lunch), a small, organic restaurant with a menu written on a chalkboard that changes to reflect seasonal offerings. We had 3 different pastas, all excellent. Broccoletti is also recommended by Elizabeth Minchelli, Rome food writer. For a taste of traditional Roman working-class food, head to the Testaccio neighborhood, the old slaughterhouse area, where you'll find lots of dishes based on innards. Checchino dal 1887 is a good place to try these foods in a more refined setting where you can see an English menu to be sure of what you're getting. There is also a large selection of wines. A great place to sit outside is the Campo dei Fiori and Obicà offers an unusual choice of foods, all based on mozzarella. If you don't want a heavy meal or want a substantial appetizer, Obicà is a good choice. A drink comes with a small taste of mozzarella, tomato, and grilled vegetable. The menu includes a number of plates, either cold cuts or vegetables, all paired with mozzarella. There's a good selection of wines by the glass to go with your food. If you're looking for a cheap meal outside the tourist areas, head to Antica Osteria da Giovanni, near the river between the Vatican and Trastevere. Don't expect anything fancy or exceptional just a very good, inexpensive Italian meal with good house wine. The small osteria has been in business for more than 50 years. For a pleasant day out in the Appia Antica Park, we enjoy eating on the spacious outdoor patio at Cecilia Metella. In addition to the ala carte menu, there are four special menus to choose from (somewhat expensive). The restaurant has a good selection of wines. Ristorante Camponeschi, on Piazza Farnese, is the favorite of Dianne Hales, author of La Bella Lingua: My Love Affair with Italian, the World's Most Enchanting Language and honorary Italian knight. The elegant restaurant has a large selection of pasta, meat, and fish dishes. Betsy Malloy says, "In two visits more than two years apart, this place has maintained its quality. At first glance, the menu looks quite traditional, until you start looking more closely at the ingredients. On our last visit (and the best meal we had during a two-week trip), we had bruschetta topped with salmon, buffalo mozzarella, and a roasted tomato; pappardelle with octopus and asparagus; thick pasta with artichokes and fresh ricotta and the house specialty tiramisu.